A/C auto amp. A/C auto amp. controls front automatic air conditioning system by inputting and calculating signals from each sensor and each switch. A/C Compressor Vaporized refrigerant is drawn into the A/C compressor from the evaporator, where it is compressed to a high pressure, high temperature vapor. The hot, compressed vapor is then discharged to the condenser. A/C switch assembly The A/C switch assembly controls the operation of the A/C and heating system based on inputs from the temperature control knob, the mode switches, the blower control dial, the ambient temperature sensor, the intake sensor, and inputs received from the ECM across the CAN. 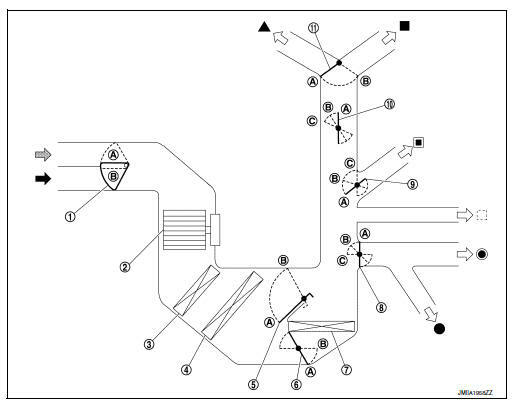 Diagnosis of the A/C switch assembly can be performed using the CONSULT. Air mix door motor LH The air mix door controls the mix of hot or cold air that enters the ventilation system. It is controlled by the A/C auto amp. based on the position of the temperature dial. The air mix door motor LH receives position commands from the A/C auto amp. Air mix door motor RH The air mix door controls the mix of hot or cold air that enters the ventilation system. It is controlled by the A/C auto amp. based on the position of the temperature dial. The air mix door motor RH receives position commands from the A/C auto amp. Ambient sensor The ambient sensor measures the temperature of the air surrounding the vehicle. The sensor uses a thermistor which is sensitive to the change in temperature. The electrical resistance of the thermistor decreases as temperature increases. BCM The BCM receives the fan ON and A/C ON signals from the A/C auto amp. and sends a compressor ON request to the ECM. Blower motor The blower motor varies the speed at which the air flows through the ventilation system. Blower motor relay The blower motor relay controls the flow of current to fuse 20, 21 and 22 in the Fuse Block (J/B). The relay is connected directly to ground, and is energized when the ignition switch is in the ON or START position. Fuse Block (J/B) Located in the passenger compartment, behind the left lower IP, the Fuse Block (J/B) contains the blower motor relay and several fuses required for the air conditioner control system. Intake door motor The intake door motor controls the position of the intake door. Fresh air is allowed to enter the cabin in one position, and recirculated inside air is allowed to enter in the other position. At times the A/C auto amp. may command partial fresh or recirculation based on evaporator or coolant temperatures. The intake door motor receives position commands from the A/C auto amp. and reports actual door position back via an LCU (Local Control Unit) installed inside the motor. The LCU reads the door position from a Position Balanced Resistor (PBR), also part of the motor, and returns that information to the A/C auto amp. 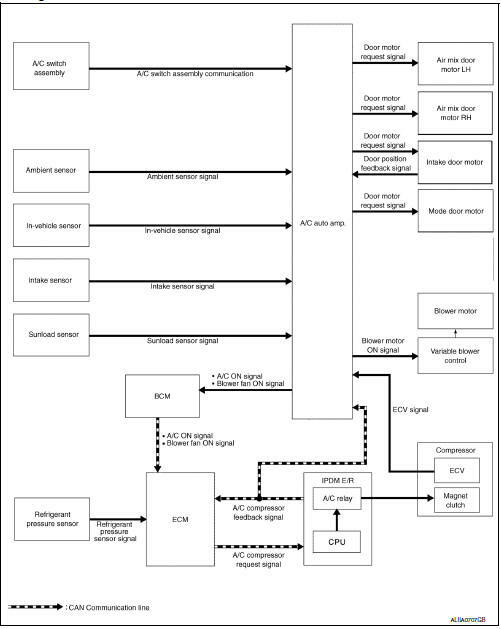 The LCU switches the polarity of the circuits connected to the DC motor to drive the motor forward or backward as requested by the A/C auto amp. Intake sensor The intake sensor measures the temperature of the front evaporator fins. The sensor uses a thermistor which is sensitive to the change in temperature. The electrical resistance of the thermistor decreases as temperature increases. In-vehicle sensor In-vehicle sensor measures temperature of intake air that flows through aspirator to passenger room. The sensor uses a thermistor which is sensitive to the change in temperature. The electrical resistance of the thermistor decreases as temperature increases. 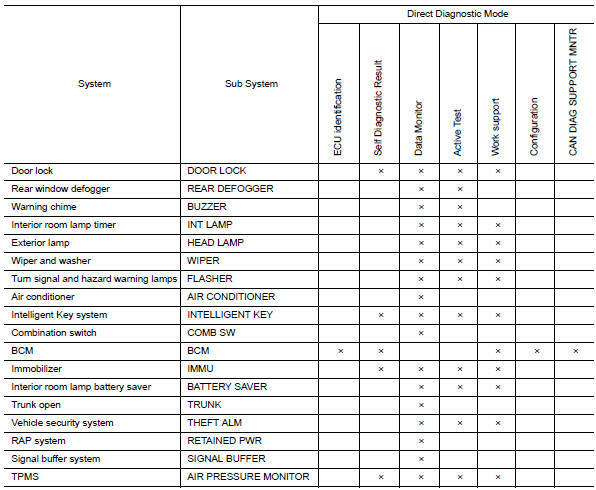 IPDM E/R Refer to PCS-7, "RELAY CONTROL SYSTEM : System Description". Mode door motor The mode door controls the direction the conditioned air passes through the ventilation system. Through a series of levers and gears, the mode door controls the defrost door, the foot door, and the vent door. There are 5 preset positions: VENT, B/L, FOOT, D/F, and DEF. The FOOT position can be set to allow some airflow through to the defroster vent, or to completely block the defroster vent using the CONSULT. The mode door motor receives position commands from the A/C auto amp. Refrigerant pressure sensor Refer to EC-29, "Refrigerant Pressure Sensor". Sunload sensor Sunload sensor measures sunload amount. This sensor is a dual system so that sunload for driver side and passenger side are measured separately. This sensor converts sunload amount to voltage signal by photodiode and transmits to A/C auto amp. Automatic air conditioning system is controlled by each function of A/C auto amp., ECM, IPDM E/R and BCM. 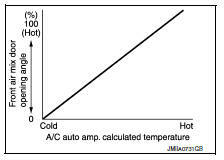 Control by A/C auto amp. A/C auto amp. controls passenger room temperature so that the optimum level always matches the temperature level that the passenger may feel. 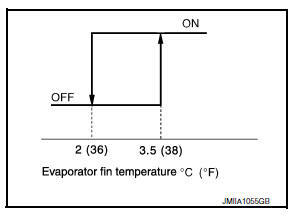 Correction is applied to the target temperature that is set using temperature control dial, according to ambient temperature detected by ambient sensor. Passenger room temperature detected by in-vehicle sensor is corrected for each front air conditioning control (driver side and passenger side). A/C auto amp. performs correction to change recognition intake temperature of A/C auto amp. quickly when difference is large between recognition intake temperature and intake temperature detected by intake temperature sensor. The correction is performed to change recognition intake temperature slowly when difference is small. Sunload amount detected by sunload sensor is corrected for each air conditioning control. A/C auto amp. performs correction to change recognition sunload amount of A/C auto amp. slowly when sunload amount changes quickly, for example when entering or exiting a tunnel. A/C auto amp. performs correction to the target temperature set by the temperature control switch so as to match the temperature felt by the passengers depending on the ambient temperature detected by the ambient sensor, and controls it so the in-vehicle temperature is always the most suitable. 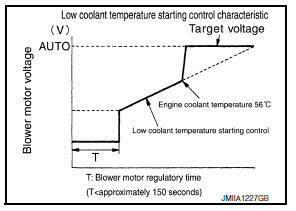 Refer to EC-47, "COOLING FAN CONTROL : System Description". 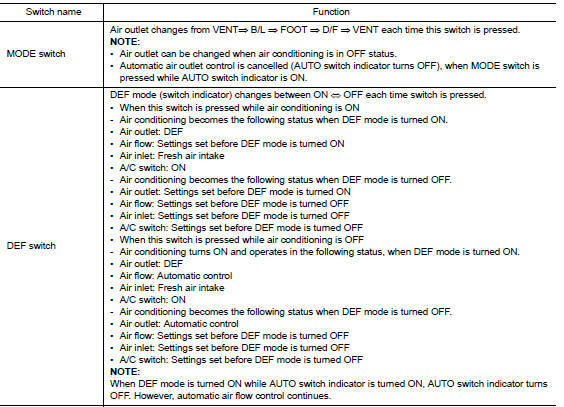 Refer to EC-46, "AIR CONDITIONING CUT CONTROL : System Description". Refer to PCS-7, "RELAY CONTROL SYSTEM : System Description". Refer to BCS-8, "BODY CONTROL SYSTEM : System Description". A/C auto amp. changes duty ratio of blower motor drive signal and controls air flow continuously. When air flow is increased, duty ratio of blower motor control signal gradually increases to prevent a sudden increase in air flow. A/C auto amp. decides target air flow depending on target air mix door opening angle. A/C auto amp. changes duty ratio of blower motor control signal and controls the air flow continuously so that air flow matches the target air flow. When air outlet is VENT or B/L, the minimum air flow is changed depending on sunload. When blower motor is activated, A/C auto amp. gradually increases duty ratio of blower motor control signal to prevent a sudden increase in discharge air flow. It takes approximately 8 seconds for air flow to reach HI from LOW. If the engine coolant temperature is 56В°C (133В°F) or less, to prevent a cold discharged air flow, A/C auto amp. suspends blower motor activation for a maximum of 150 seconds depending on target air mix door opening angle. After this, blower motor control signal is increased gradually, and blower motor is activated. When front evaporator fin temperature is high [intake sensor value is 35В°C (95В°F) or more], to prevent a hot discharged air flow, A/C auto amp. suspends blower motor activation for approximately 3 seconds so that front evaporator is cooled by refrigerant. 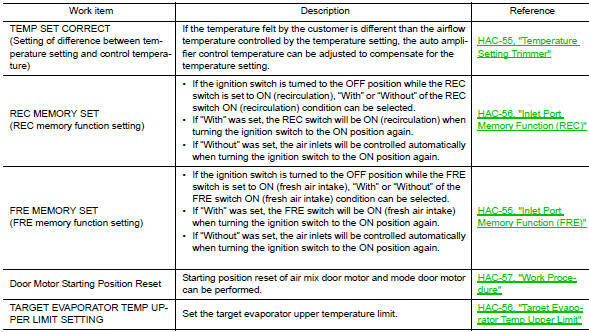 When mode door motor is activated while air flow is more than the specified value, A/C auto amp. reduces fan speed temporarily so that mode door moves smoothly. 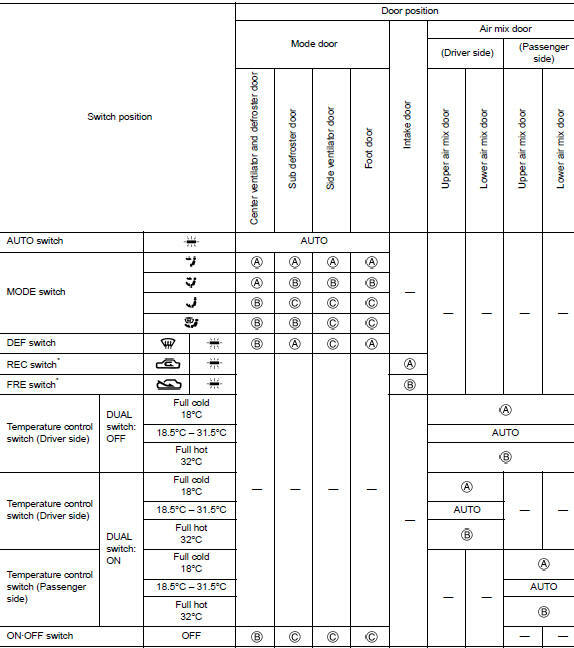 The intake door is automatically controlled by the temperature setting, ambient temperature, in-vehicle temperature, intake temperature, amount of sunload and ON/OFF operation of the compressor. Intake door automatic control selects FRE, 20% FRE, or REC depending on a target air mix door opening angle, based on in-vehicle temperature, ambient temperature, and sunload. While air outlet is in automatic control, A/C auto amp. selects the mode door position depending on a target air mix door angle and outlet air temperature calculated from sunload. If ambient temperature is excessively low, D/F is selected to prevent windshield fogging when air outlet is set to FOOT. When the compressor activation condition is satisfied while blower motor is activated, A/C auto amp. transmits A/C ON signal and blower fan ON signal to BCM. BCM transmits the A/C ON signal and blower fan ON signal to the ECM via CAN communication line. ECM judges that the compressor can be activated depending on the state of each sensor (refrigerant pressure sensor signal and others) and transmits A/C compressor request signal to IPDM E/R via CAN communication. IPDM E/R turns A/C relay ON and activates the compressor depending on request from ECM. When high-pressure side value that is detected by refrigerant pressure sensor is as per the following state, ECM requests IPDM E/R to turn A/C relay OFF and stops the compressor. When the engine starts while the engine coolant temperature is 56В°C (133В°F) or less, ECM activates the compressor for approximately 6 seconds and circulates the compressor lubricant once. When intake sensor detects that front evaporator fin temperature is 2В°C (36В°F) or less, A/C auto amp. requests ECM to turn compressor OFF, and stops the compressor. When the front evaporator fin temperature returns to 3.5В°C (38В°F) or more, the compressor is activated. When set engine is running is excessively high load condition, ECM requests IPDM E/R to turn A/C relay OFF, and stops the compressor. 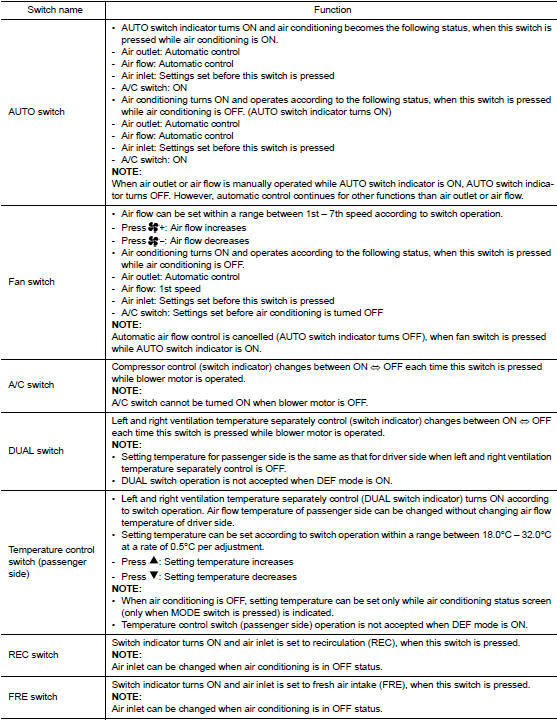 Refer to EC-46, "AIR CONDITIONING CUT CONTROL : System Description". The step motor system is adopted for air mix door motor (driver side). When a drive signal is input from A/C auto amp. to door motor, a step motor built into the door motor rotates according to the drive signal, and then stops at the target door position. Rotation of motor is transmitted to air mix door (driver side) [upper air mix door (driver side) and lower air mix door (driver side)] by link, rod and lever, then air flow temperature (driver side) is switched. The 4 drive coils are excited in sequence in order to drive the motor. Direction of rotation is changeable by recomposing pattern of excitation. The step motor system is adopted for air mix door motor (passenger side). Rotation of motor is transmitted to air mix door (passenger side) [upper air mix door (passenger side) and lower air mix door (passenger side)] by link, rod and lever, then air flow temperature (passenger side) is switched. The step motor system is adopted for mode door motor. Rotation of motor is transmitted to mode door (center ventilator and defroster door, sub defroster door, side ventilator door, and foot door) by link, rod, and lever, then air outlet is switched. Intake door motor consists of motor that drives door and PBR (Potentio Balance Register) that detects door position. Motor operates intake door according to control signal from A/C auto amp. Rotation of motor is transmitted to intake door by lever, then air inlet is switched. PBR (Potentio Balance Register) transmits PBR feedback signal to A/C auto amp. according to motor position. According to PBR feedback signal, A/C auto amp. monitors that motor is in an appropriate door position. When ignition switch is in the ON position, A/C auto amp. always automatically controls temperature regardless of front air conditioning operational state. Air mix door is controlled depending on the comparison of current air mix door opening angle and target air mix door opening angle. 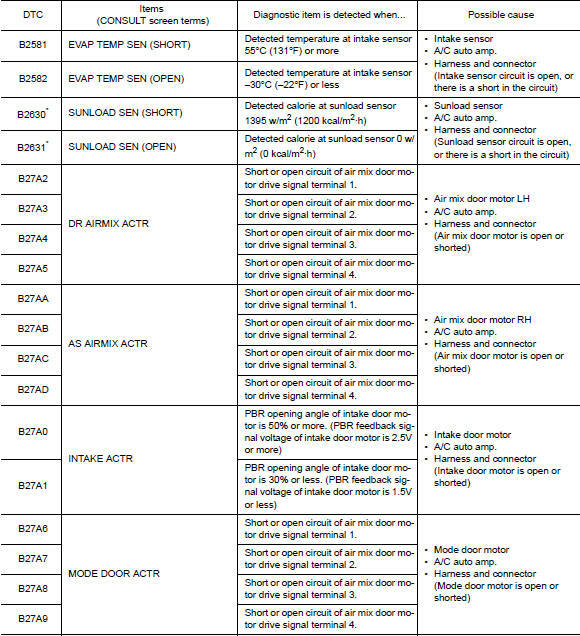 Regardless of in-vehicle temperature, ambient temperature, and sunload, air mix door is fixed at the fully cold position when set temperature is 18.0В°C (60В°F), and at the fully hot position when set temperature is 32.0В°C (90В°F). Air conditioning system performs self-diagnosis, operation check, function diagnosis, and various settings using diagnosis function of each control unit. Consult can display each diagnosis item using the diagnosis test modes as shown. Refer to hac-38, "dtc index". *: Perform self-diagnosis under sunshine. When performing indoors, aim a light (more than 60 w) at sunload sensor, otherwise self-diagnosis reports an error even though the sunload sensor is functioning normally. When the battery cable is disconnected from the negative terminal or when the battery voltage becomes 10v or less, the setting of work support may be cancelled. 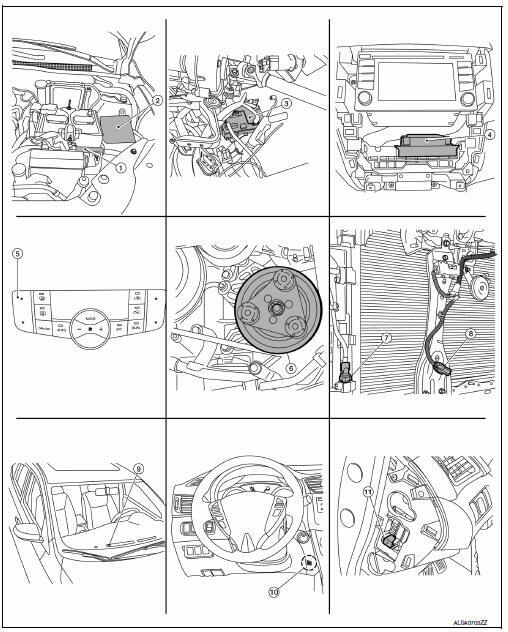 Perform the inspection of each output device after starting the engine, because the a/c compressor has been operating. Consult performs the following functions via can communication with bcm. BCM can perform the following functions. 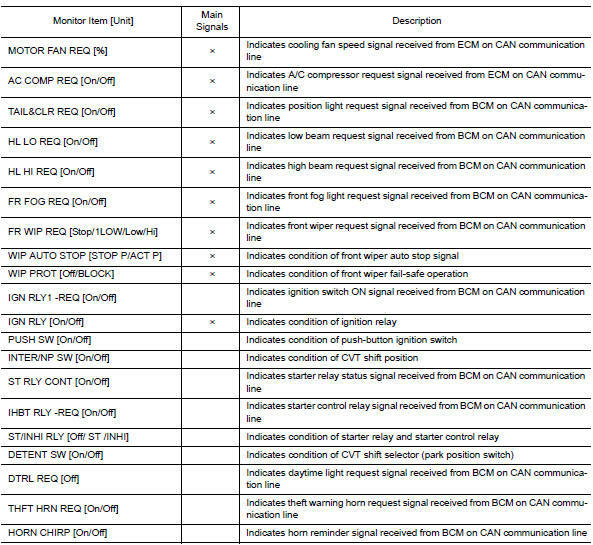 In auto active test, the ipdm e/r sends a drive signal to the following systems to check their operation. Never perform auto active test in the following conditions. When auto active test is performed with hood opened, sprinkle water on windshield beforehand. Turn the ignition switch on, and within 20 seconds, press the driver door switch 10 times. Then turn the ignition switch off. Turn the ignition switch on within 10 seconds. After that the horn sounds once and the auto active test starts. After a series of the following operations is repeated 3 times, auto active test is completed. When auto active test has to be cancelled halfway through test, turn the ignition switch off. When auto active test is not activated, door switch may be the cause. Check door switch. 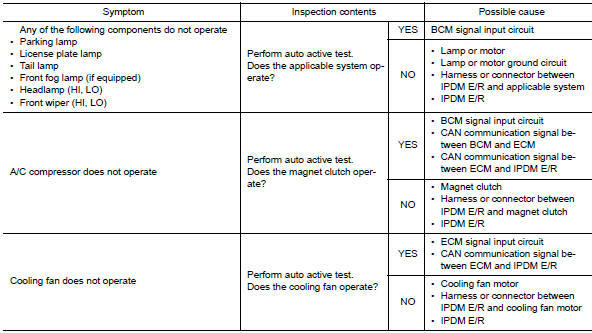 Refer to DLK-103, "Component Inspection". When auto active test is actuated, the following operation sequence is repeated 3 times. Ipdm e/r starts the auto active test with the door switch signals transmitted by bcm via can communication. Therefore, the can communication line between ipdm e/r and bcm is considered normal if the auto active test starts successfully. The auto active test facilitates troubleshooting if any systems controlled by ipdm e/r cannot be operated. Consult performs the following functions via can communication with ipdm e/r. The IPDM E/R part number is displayed. Refer to PCS-20, "DTC Index". Refer to LAN-13, "CAN Diagnostic Support Monitor".